A beautiful embroidered 22x14 flag with the tournament logo in the center and your company name at the bottom, suitable for framing. Your flag will fly along with a sign on the tee box. Your name listed in the souvenir program. A special "Thank You" luncheon on Friday, Oct. 4th, 2019 at Outback Steakhouse for you and a guest. 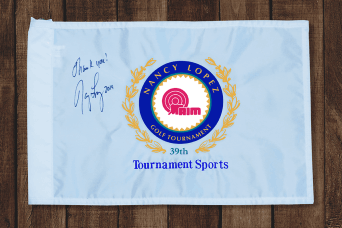 A gift from Nancy Lopez to thank you for your support. An autographed photo of you and Nancy Lopez. One spot to play in the tournament on Monday, Oct. 7th, 2019. All flag information must be received no later than Friday, August 23nd, 2019.